I absolutely love the winter. Growing up in Utah, I learned to alpine ski and snowshoe to enjoy the snow. 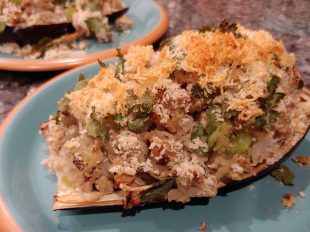 Since I also love to garden, it’s wonderful to make meals using seasonal ingredients. Squash has always been a staple in my diet. 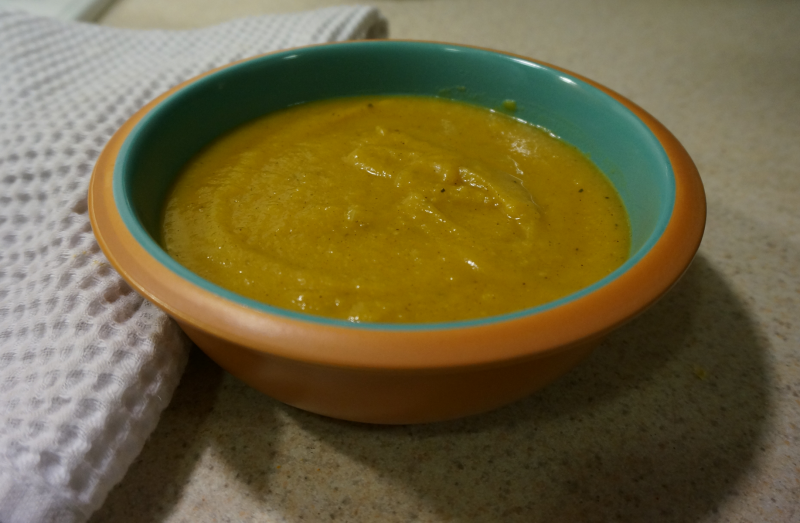 Relieved squash isn’t high in nickel; my spouse makes this delicious nickel free butternut squash soup. 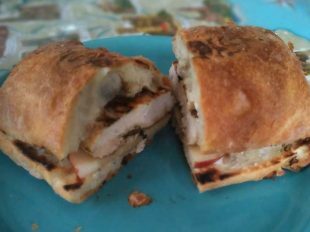 Deliciously simple, this recipe is perfect for the blistery cold winter day. 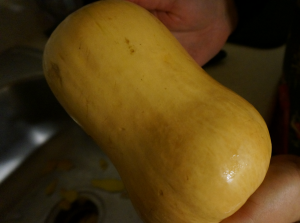 A medium to large butternut squash will yield a lot of soup! I use a standard carrot peeler to peel the butternut squash. Peel the outside of the butternut squash, like you would peel a carrot. 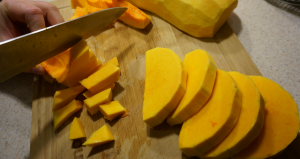 Once it is fully peeled, use a large cutting board and sharp knife to cut off the ends of the butternut squash. 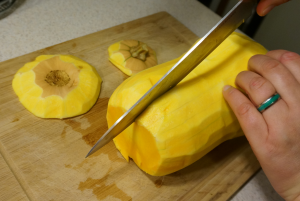 It can be very difficult to cut up the butternut squash, so cut it slowly and carefully. You might have to rotate the butternut squash when you cut off the ends. I recommend using a sharp knife and large cutting board. Carefully cut the ends off the squash and slice it in half. Next, cut the butternut squash in half, length wise, and scoop out the seeds. 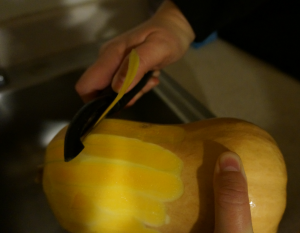 Then turn over the butternut squash so the inside is face down on the cutting board. Begin cutting the first half by slicing it slices –width wise – in ½ inch increments. Then cut the squash again in cubes, until the entire squash is cut up into cubes. The squash looks like a tough mango while you cut it up into cubes. I use a ceramic coated Dutch oven. You can also use a very large pan. Coat the bottom of the pan with 3 tablespoons olive oil. Begin to place the cubes of butternut squash in the pan. 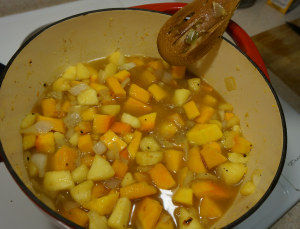 Once all of the squash is in the pan, turn the heat on medium low, so the squash begins to sauté. 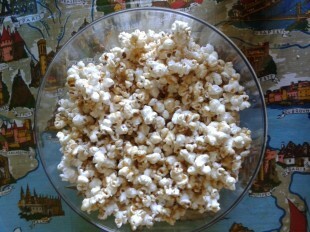 Stir constantly, so it doesn’t burn on the bottom. Cut up the onions and place them on top of the squash and add the black pepper. The sweet onions really bring out the flavor of the butternut squash. I recommend using at least one onion and if you want the soup a little spicier, use two onions. 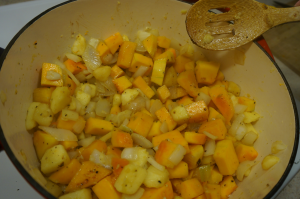 Continue to stir the squash and onions regularly in the oil. Next peel the apples and cut up the apples and garlic. When the butternut squash and onions begin to soften, then add the garlic and apples and let it all sauté for about 5 minutes stirring constantly. Saute the peppered squash onions & apples. When the butternut squash is soft, add 32 oz of low sodium chicken stock. 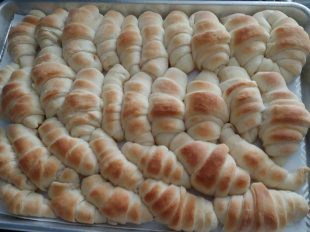 It should be enough stock to almost cover up the vegis and fruit mixture. At this point, add the chopped ginger, cinnamon, nutmeg, ground cloves, ground all spices and bay leaves. Once you add the fluid and spices turn up the heat on the stove to medium and place the cover on top to allow it to simmer. Simmer the mixture of ingredients for 25-30 minutes, stirring 2-3 times while it simmers. After about 25 minutes, check to see if the squash is completely softens. If it is, then let the mixture cool for a couple minutes. Lastly blend the cooked butternut soup with an inversion blender on high until all the squash, apples and onions are blended thoroughly. Be sure to remove the 3-4 bay leaves before you blend. 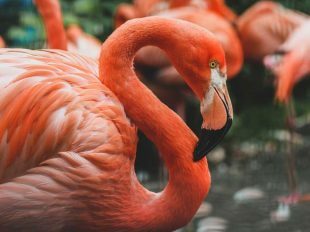 If instead you want to use a traditional blender, allow steam to release. I use my inversion blender to blend the soup after it’s simmered for 25-30 minutes. Let the soup cool a little. 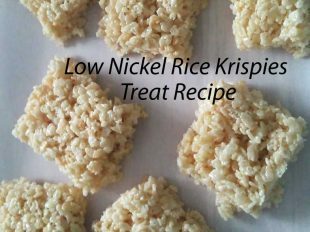 Then serve and enjoy this nickel free dish as either a side or a stand alone meal. Does the inversion blender not have to be nickel-free? I don’t know. 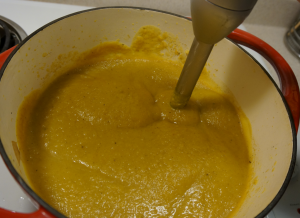 I haven’t experienced terrible eczema making this butternut squash soup or other soups when I use my immersion blender.